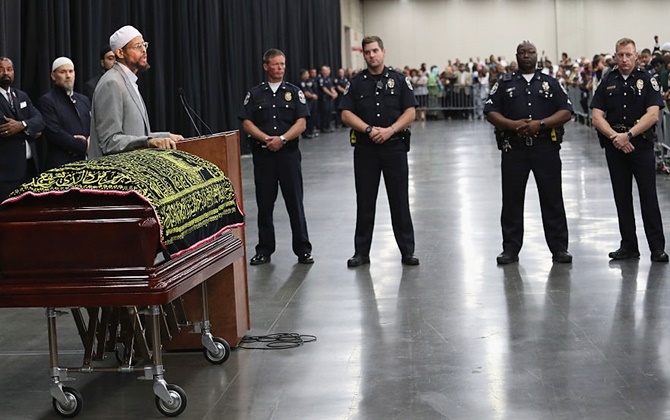 IMAGE: The casket with the body of Muhammad Ali arrives for an Islamic prayer service at the Kentucky Exposition Center. Photograph: John Moore/Getty Images. Muhammad Ali will be laid to rest Friday, the culmination of a two-day farewell for the beloved boxing legend and civil rights hero who electrified crowds the world over. Thousands from near and far are expected to line the streets of Ali's native city of Louisville in the southern US state of Kentucky to bid goodbye to the three-time heavyweight world champion who died last week at 74 after a decades-long battle with Parkinson's. 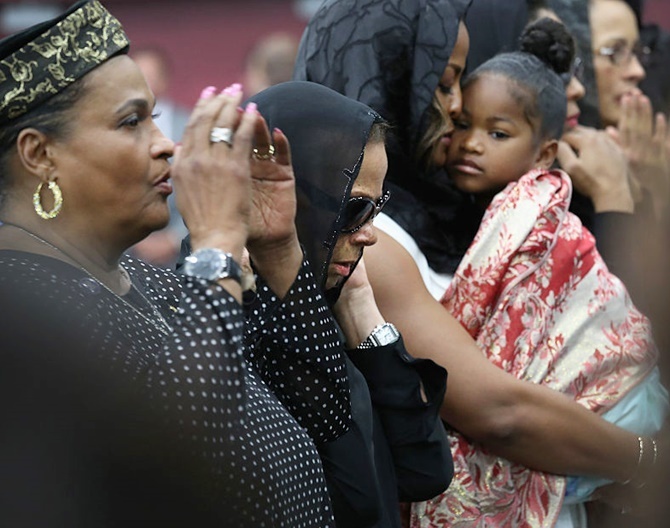 IMAGE: Muhammad Ali's second wife Khalilah Camacho-Ali, left, his fourth wife Lonnie Ali, centre, and daughter Laila Ali holding a grandchild, pray during an Islamic prayer service. Photograph: John Moore/Getty Images. Starting at 9 am (1300 GMT), the funeral procession will wind through the city of 600,000 where Ali was born at a time of racial segregation. It will pass sites that were important to "The Greatest": his childhood home, the Ali Center, the Center for African American Heritage -- which focuses on the lives of blacks in Kentucky -- and, of course, along Muhammad Ali Boulevard before arriving at the Cave Hill Cemetery for a private burial. IMAGE: Police stand guard during an Islamic prayer service for Muhammad Ali. The jenazah service was held for the four-time world heavyweight boxing champion, who died on June 3 at age 74. A procession and memorial service are scheduled for Friday. Photograph: John Moore/Getty Images. 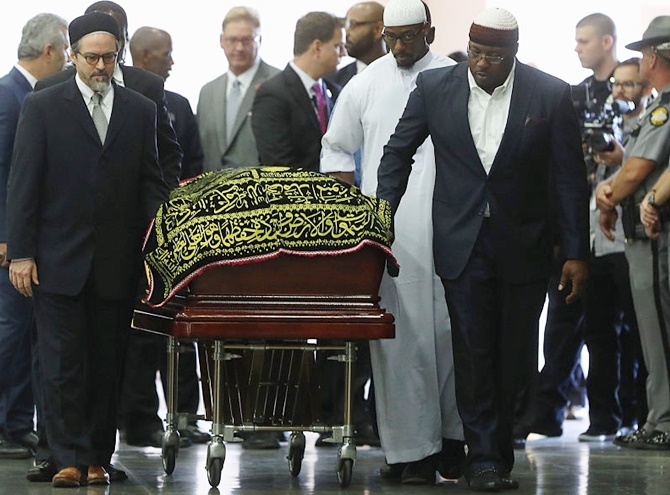 A Muslim funeral for Muhammad Ali on Thursday drew thousands of admirers to the boxer's hometown of Louisville, Kentucky, where mourners prayed over the body of a man who battled in the ring and sought peace outside it. 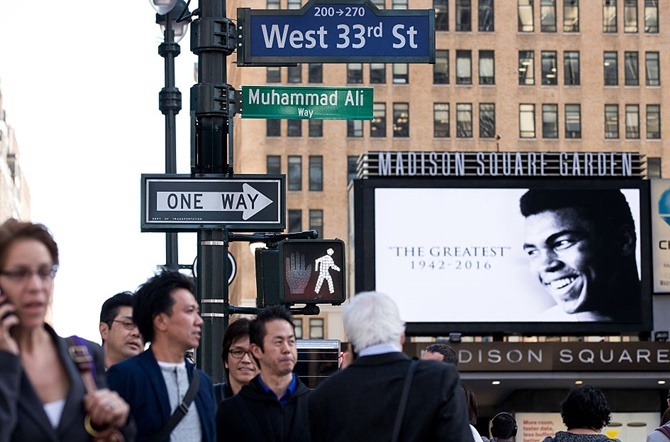 IMAGE: 'Muhammad Ali Way,' a temporary street sign in honour of the late boxer, is displayed on the corner of West 33rd Street and Seventh Avenue near Madison Square Garden, in New York City. Photograph: Drew Angerer/Getty Images. An estimated 14,000 people, representing many races and creeds, attended the jenazah, or "funeral" in Arabic, where he was repeatedly feted as "the people's champion." Ali, a three-time heavyweight champion known for his showmanship, political activism and devotion to humanitarian causes, died on Friday of septic shock in an Arizona hospital. He was 74.